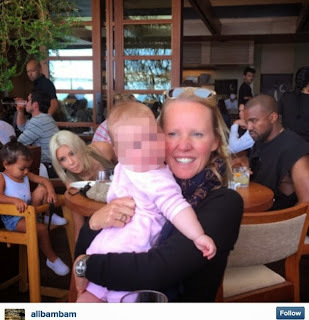 Kim Kardashian might be famous for, well, being Kim, but today she's become famous for being something of an accidental photobomber, along with husband Kanye West and daughter North. Yep, unbeknownst (probably) to the gorgeous Alice Bamford and her baby daughter, Kim Photo-crash-ian and her family were having a spot of lunch right behind her when she decided to take this lovely photo. Or was it planned? WHO KNOWS.